Hello everyone!!! I made up a Paper Mario seires fan club! I'm talking to people that just love Paper Mario. Tell me in my talk page and I'll give it to you with my promission. Here is a quick look at the user box I made! This user just LOVES the paper mario series and is in it's fan club. I actually don't know why I like these ghosts so much. Let's see...he has his own Dimension, He can kill a person in a second, and he's just plain awesome. 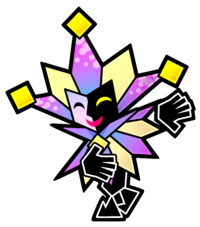 This user thinks that Dimentio is awesome. This user likes Luigi better than Mario. This user wants a Wii U RIGHT NOW!!! This user thinks that this Yoshi should stop eating helpless Goombas. This user likes to listen to videogame music. This user likes Fawful. I HAVE FURY! This user fell on the floor laughing when he saw this. Also, PENGUINS RULE!!!! prog-0 This user cannot program at all( and doesen't even know what it means). sprite-0 This user cannot rip sprites at all(and doesn't even know what it means). fan-240px This user loves the Wii console. fan-3 This user's favorite console is the 3DS(for now). fan-0 This user dislikes the video game character Link. fan-3 This user's favorite videogame character is Megaman. Nin-0 This user dislikes the Nintendo character Wario. Nin-2 This user is a big fan of the Nintendo character Dimentio. Nin-340px This user's favorite Nintendo character is Boo. fan-3 This user thinks that Super Paper Mario is the best videogame ever made. fan-0 This user dislikes the Donkey Kong. videogame series. fan-340px This user thinks that Paper Mario is the best videogame series ever established. 50px Enter the tenth world! This user is friends with World10. 70px This user is a loyal minion (friend) of Dry Bowser rules! This user is friend with Mr.L1998. This user is a sweet friend with Super Candy. text or image (example; This user is an awesome friend of SmartYoshi. This page was last edited on November 4, 2012, at 09:56.